The KFJC 2013 artist shirt comes from the creative mind of Shelby Hohl out of Houston, Texas. Shelby has made concert posters for Swans, Deerhoof, Japanther, High On Fire, Lightning Bolt, Devendra Banhart, Cradle Of Filth and Aids Wolf among many others. His work can range from horror to baroque to science fiction to the surreal and can sometimes include a political or social edge. 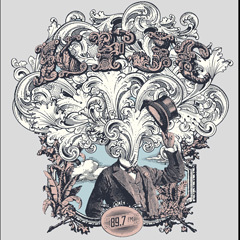 Shelby’s design for KFJC’s artist shirt shows off an intricate image harkening back to the 1800’s in a colorful mind explosion unleashing the radio station’s call letters. An utterly beautiful bedlam of fancy. The KFJC Underground Artist Series T-Shirt is available on a 100% cotton gray shirt as our thanks for your generous donation of $45 or more.